If you've never thought about it, chances are you may not have a pattern for when your eyes are looking where. If that's the case, let me suggest one for you today. Welcome to Eye Patterns 101: The Basics for Your Pool Peepers. Let's first identify two things. CB = Cue Ball. OB = Object Ball. When you see OB, this refers to the specific contact point on the object where you are aiming. Aiming is a completely different topic and is very intuitive, so if you aim for a spot on the table or through the object ball, just use that point when you see OB. For most shots, you'll want to start and finish with your eyes on the OB. As you address the shot and begin to get down to shoot it, focus your eyes on the OB while keeping the CB in your peripheral. If you've never approached a shot this way, you will inevitably foul the CB with your cue stick. It's okay. This takes some practice but you'll get used to it. Once you're down on the shot, with your eyes locked on the OB, now you can begin your warm up strokes. I recommend looking back to the CB while the stick is moving. This allows your eyes to give each action its undivided attention. Take this opportunity to decide where you want to strike the CB and aim your tip to that contact point. 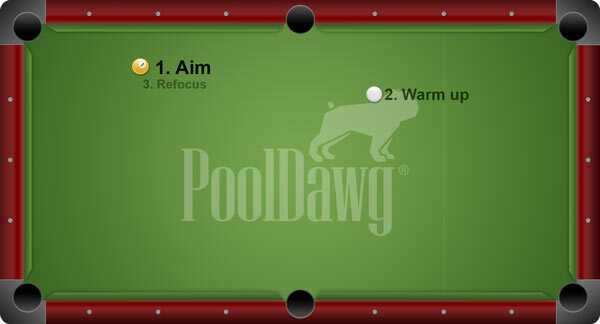 Once you're fully committed to that spot and ready to shoot, freeze everything with your cue stick in the forward position, as close to the CB as possible. Now, look back to the OB and allow your eyes to recommit to that contact point. It takes your eyes just a moment to refocus so allow yourself all the time you need. Once you feel ready, go ahead, pull back and execute. I'm a big fan of this eye pattern because it allows my eyes and my brain to separate aiming from applying cue ball spin. When I'm looking at the OB, I'm focused purely on the where to contact the ball to pocket it. When I'm looking back at the CB, now I'm deciding what kind of spin I want to use. This allows me to give each contact point its undivided attention. There are several variations of this eye pattern. Again, the key is to start and finish with your eyes on the OB. Some players prefer to shift their eyes back and forth between the OB and CB during their warm up strokes. Where ever you're looking in between, just make sure you return your focus to the OB and regroup before pulling the final trigger.